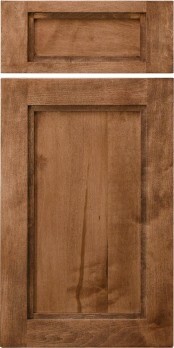 Conestoga released the Savannah door in 2013 due to popular request from customers seeking an alternative to shaker doors, but with a stepped down framing bead. The bead area on this door is perfectly flat, offering a unique look. It is critical to note that the seam in the bead where the two pieces of framing come together will never be invisible and when painted, this seam can be highly visible. If considering painted doors, we strongly suggest choosing the Crawford door which has a similar look, only with a much narrower flat area on the bead. “Awesome quality on everything it's been fun and a learning experience.” — Scott M.